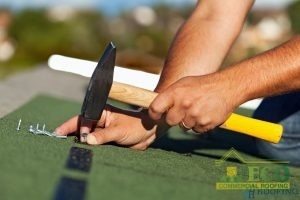 Our Emergency Roof Repairs Are Fast and Affordable. We never want to experience roof emergencies, especially since they are often followed by other damages to the home! The professionals at ECO Commercial Roofing can assist you with affordable, swift emergency roof repair in Texas, Louisiana, and Mississippi. For years, our team has been happily serving our community with fast roofing repairs, and we’re happy about what we do. Call us today at (833) 200-0571 for all of your roof needs, such as leaks, damages, and even replacements! Roofs are susceptible to various kinds of damages, but many of the calls we get originate from storm damage. Storms can batter your roof with damage such as heavy winds and hail. Another typical roof emergency is when animals create holes or nests in a customer’s roof. Nests, as well as food stores left by critters, can leave you open to leaking and wood rot. At the first sign of roof damage, don’t hesitate to call our experts at (833) 200-0571! We provide a wide variety of dependable roof services, and our team is ready to help you with any repairs, installations, as well as all of your home’s roof emergencies. Storms Can Be Very Destructive, But Our Repairs Are Affordable, Fast, And Efficient. After calling us for emergency roof repair, our contractor rush over and immediately evaluates your roofing for any signs of damage. There are a few different methods available for addressing emergency roof issues quickly, and depending on the circumstances, we will pick whichever one appropriately suits your needs. Generally speaking, our contractors will start by removing any debris, and cover the harmed roofing with a waterproof tarp to defend the roof from further damages. Then we can supply you with a damage assessment for your insurance claim, as well as arrange scheduling and cost for complete repairs. You can always count on our contractors for your roofing emergencies, no matter what type of problems you run across. Call us today at (833) 200-0571 to get the emergency roof repair in Texas, Louisiana, and Mississippi that you require now!